Rick is a Professor in Biology at the University of Sydney. His research spans a wide range of species, ecosystems and conceptual areas, but focuses most strongly on the ecology and evolution of reptiles and amphibians. In particular, his recent work explores ways in which fundamental field-based ecological research can be used to develop innovative approaches to conservation challenges. He has published more than 700 papers in scientific journals, and is among the world's most highly cited authors in his field. Rick has received numerous awards for excellence in research, including the E. O. Wilson Award by the American Society of Naturalists, the Mueller Medal by ANZAAS, the Eureka Prize for biodiversity research, and the Macfarlane Burnet Medal by the Australian Academy of Sciences. 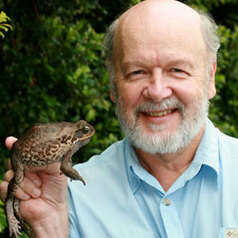 He was elected to the Australian Academy of Science in 2003, and received an Order of Australia (AM) in 2005. He contributes regularly to media debates, and was included in the Sydney Magazine’s list of Sydney’s 100 most influential people for 2008.